This is the second in a three-part series about the sharks that swim in our waters, especially during tarpon season. This part will be from a shark angler’s perspective, and the third part will pertain to what types of sharks are in our waters and how dangerous they are to humans. Night fishing in Boca Grande Pass is one of the best times an angler can experience, but when you’re in a tiny kayak filled with bloody meat in shark-infested waters it’s a whole new level. A local shark fisherman we will call “K” prefers not to be named, but he spent some time discussing what it is he does, why he does it and why it’s so misunderstood. He was born in a house very near the Boca Grande Causeway, but his family has since moved. Either way he’s a Florida boy who has fished these waters for more than two decades. “I’ve fished coastally my whole life, and I’ve been land-based sharking for five years now. Land-based sharking is appealing to me because I find it to be a more pure form of fishing, more fair to the fish. Sharking off Boca (Grande) is obviously special due to the fact the tarpon migration occurs in the Pass and the bull sharks spawn in Charlotte Harbor. It makes for a very active island for sharks. Bait is whatever the sharks are eating at the time, like rays, catfish, mullet, etc. Shore-based shark fishing faces a definite stigma here on the island. Some people have found stinking, bloody buckets of bait left on the beach, others have found trash. Just recently the headless shark found near 1st Street created a sizable commotion, and many said it was the shark fishermen who were the culprits. Some people are merely uncomfortable when they see people on the beach in the wee hours of the night. K said conservation has become a vital part of maintaining our fisheries, and that includes sharks. There is that five percent, though, that is beyond their control. As with tarpon fishing there is that occasional time when the shark does die. K doesn’t care for shark meat himself, so he does his best to catch and release, after doing quick measurements, taking some other statistics and placing a dermal tag on the shark in the name of research. He said there are many shark fishermen on the island who work with agencies like the Florida Fish and Wildlife Conservation Commission as citizen volunteers. The specific group K is tagging for is the Coastal Shark Tagging Initiative (coastalsharktagging.org). Anyone who wants to volunteer their time (and occasionally skin) can go to the site to get tags and information regarding how to attach them to the shark. While K wouldn’t be specific about what he uses for bait, he laughed and reassuringly said it wasn’t anything like “cats and dogs.” This is another tale told in the cyber world, that many shark fishermen use household pets found on Craig’s List or other sites for bait. While we’re not saying it hasn’t happened before, people are more likely to use road kill than to go to the trouble of going to someone’s house and spending time picking up an animal to be used in that manner. 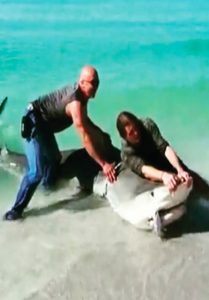 As far as getting them to shore in a timely manner, K said time is of the essence to keep the shark healthy and give it the ability to swim away swiftly after being caught and tagged. Handling a large shark in the name of tagging it can be risky business, obviously, but K loves to do it. Getting the shark to the beach is about as difficult as it sounds sometimes. K said it is very important to the shark’s survival that the catch goes as quickly as possible. It’s a “little” expensive, K said, to the tune of an average of $10,000 for the gear. K’s disdain for inexperienced anglers who don’t follow the rules of common courtesy is apparent. He said the reason most people on the island think all shark fishermen leave trash and bait on the beach is because the good shark fishermen – and he said they are in the majority – don’t leave a trace that they’ve been there. According to K, shore-based shark fishing is one of the even playing fields between man and fish. It is an adrenaline rush well earned, as one man can take a 500-pound monster from his home turf in the water and bring it to the beach … his own territory. Next week’s article, the last of three parts – will contain more specific information about the sharks in our local waters – the good, the bad and the ugly. Newer PostIsland voters, don’t forget to request a ballot!